What Should We Be Building? Currently one in twenty-five people are at retirement age; in the near future, this figure will jump to one in eight (Weinstein, 2000). This demographic curve represents the cohort commonly referred to as "baby-boomers," who will retire as an influential, active, and expectant body of individuals (Levin, 2002; Peck, 2003; Administration on Aging, 2000). Many buildings are designed specifically for this growing population, but even in award-winning long term care (LTC) facilities, where an estimated one in three residents have some form of hearing impairment, the quality of the acoustical environment is often not appropriately addressed (Dugan, 2003; Healthcare Design, 2002; Healthcare Design, 2003). These unique design issues include understanding the effects of aging upon the hearing process, application of existing acoustical standards, research in health care facilities, and an evaluation of what should be built to maintain a high quality of life. By 2030 the number of persons 65 and over is expected to be larger than the population of children under 17 (Weinstein, 2000; see Figures 1 & 2). This represents a change in demographics that will be felt across all aspects of society. Known as the baby-boomers, this generation will reach retirement as an influential, active, and expectant body unlike any before (Levin, 2002; Peck, 2003; Administration on Aging , 2000). Healthcare providers especially must be prepared to serve this demanding cohort. Many of these individuals will face the challenges of aging while residing in long-term care (LTC) facilities. At age 65, one out of three older adults suffers some kind of hearing loss (Dugan, 2003). This staggering percentage of a growing demographic highlights a specific niche that must be addressed in environments built for the elderly. Current acoustic considerations are being made according to information on normal hearing; few designers are addressing issues of acoustics and hearing impairment (Davies, Cox, Kearon, Longhurst, & Webb, 2001). The distribution of hearing aids alone will not meet the needs of this group. Part of the solution for maintaining quality of life for residents of LTC facilities is analyzing the relationship between the physiological and psychosocial needs of those with hearing loss and their interaction with the built environment. Establishing a set of acoustical standards for these environments would provide a springboard to continued research and application of standards that create the richest and most "usable" environments. Weinstein, B.E. (2000). Geriatric audiology (p. 4). New York: Thieme. Hearing loss is among the three most common chronic conditions reported among older adults (Weinstein, 2000). It may be caused by heredity, prolonged exposure to loud noise, injury, disease, medication, or simply aging (Barber, 1996). As a foundation from which to discuss the effects of hearing loss, it is important to understand the basic physiology of hearing. 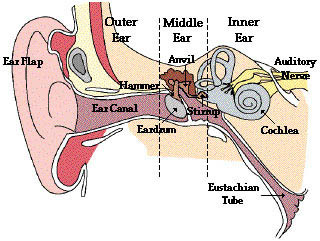 There are three major parts to the ear: the outer ear, the middle ear, and the inner ear (see Figure 3). Sounds are gathered and funneled through the outer ear by the pinna, or the ear flap. The sound waves then travel along the auditory canal where they hit the eardrum. The structure from the pinna to the eardrum acts like an organ pipe. Its dimensions configure it to hear certain frequencies. Although we hear frequencies between 20- to 20,000-Hz, our ears are "tuned" to frequencies in the range of 2000- to 3000-Hz. This is the upper range of the frequencies produced in human speech, especially consonant sounds, and children's and women's voices (Cowan, 2000). When the sound reaches the eardrum it enters the middle ear. The sound waves cause the eardrum to vibrate (mechanical energy), and the vibrations are transmitted to three small, connected bones: the malleus, the incus, and the stapes, also known as the hammer, anvil, and stirrup. These bones adjust the volume and intensity of sounds so that they are suitable for the inner ear. When the vibrations reach the cochlea, a spiral-shaped, fluid-filled structure covered with approximately fifteen thousand tiny hair cells, they have reached the inner ear (Hull, 1995). These receptors vibrate in the surrounding fluid, changing the mechanical energy into electrical energy that is sent to the brain along the auditory nerve allowing us to perceive sound (Cowan, 2000). Hearing loss is categorized in two general types: conductive and sensorineural. Conductive hearing loss occurs when sound waves cannot reach the inner ear due to blockage, usually in the middle ear. This type of hearing impairment generally causes sounds to be faint or muffled, while the speakers may think their own voice sounds louder than it actually is (Barber, 1996). In many cases conductive hearing loss can be corrected through medical treatment, surgery or hearing aid use (National Institute on Deafness and Other Communicative Disorders, n.d.). Older adults with hearing impairments most often have the second type, sensorineural hearing loss. This occurs when the inner ear is damaged, usually involving damage to the hair cells. It generally manifests itself through difficulty hearing in crowded environments with background noise and speech comprehension. 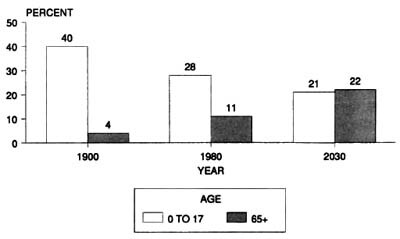 It especially affects perception of the higher, "tuned" frequencies discussed earlier (Barber, 1996). Medical treatment and surgery generally cannot correct sensorineural hearing loss, making it a permanent condition. Hearing loss among older adults manifests itself in various impairments. The most common conditions affecting the older population are presbycusis and tinnitus. Presbycusis is literally "elder" (presby) + "hearing" (akousis) and it affects approximately 18 million older adults (Barber, 1996; Hull, 1995). It becomes more prevalent, and continues to worsen, as the individual ages. 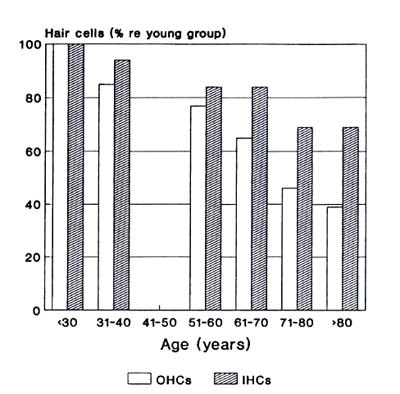 Presbycusis has been directly related to diminishing or damaged hair cells in the inner ear (see Figure 4). As a type of sensorineural hearing loss it cannot be corrected through medical treatment or surgery. Presbycusis manifests itself in two major ways. First the individual loses sensitivity to higher frequency sounds in both ears. Secondly, speech cognition weakens at a rate mostly unrelated to their auditory sensitivity loss. This is commonly represented in the response of many elderly that, "I can hear you, but I cannot understand what you are saying" (Hull, 1995, p. 22). Presbycusis is more than just hearing loss; there is a physiological factor that affects the central auditory system and the processing of what a person hears. For this reason hearing aids, which only amplify sound, do not present the solution to presbycusis. Weinstein, B.E. (2000). Geriatric audiology (p. 61). New York: Thieme. Although tinnitus is not as age-related as presbycusis, it is a hearing condition that 33% of older adults experience (University of Maryland Medicine [UMM], n.d.). Tinnitus is a ringing of the ears that is not stimulated by any sound. It can be caused by other hearing impairments, exposure to loud noise, medications, and allergies; tinnitus also behaves as a symptom to other illnesses or diseases (American Tinnitus Association [ATA], n.d.). Quality of life is significantly compromised for about one quarter of those with tinnitus symptoms. The pain suffered by tinnitus is often on an emotional level. The limbic system, which controls emotional responses, reacts to the tinnitus by triggering the autonomic nervous system. The results often include problems sleeping, stressed attention levels leading to anxiety, and suppression of positive emotions that can lead to depression. There is no "cure" for tinnitus, but in some severe instances relief can be found through Tinnitus Retraining Therapy (TRT) which incorporates counseling and sound therapy to decrease the notice-ability of the ringing (UMM, n.d.). Hearing loss also manifests itself through psychosocial effects in the lives of the elderly. Despite the fact that most Americans realize that hearing loss is associated with aging, the process often happens so gradually that they do not realize it as it is happening. Communication is a significant aspect of maintaining relationship and fostering social interaction for any age level. Unexpected loss of speech cognition can stress these relationships. 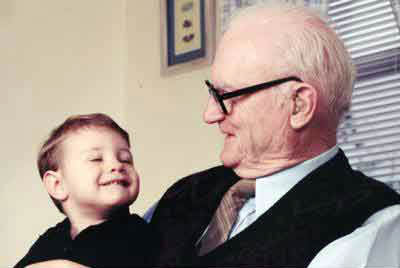 Professor Dr. von Wedel, at the Beethoven Discussions in Germany (2002) gives three spheres of interaction that must be maintained to preserve quality of life for the hearing impaired: family relationships, social relationships (friends, acquaintances, co-workers), and interaction with society as a whole. Fear, embarrassment, or confusion related to hearing loss keeps older adults from maintaining these relationships and may cause them to lose self-confidence and withdraw from social settings. If their hearing loss remains untreated or undiagnosed this stress can lead to depression, anxiety, paranoia, feelings of helplessness, passivity, and isolation (Reinemer & Hood, 1999; Resnick, Brant, & Verbrugge, 1997). Resnick et al. (1997) also reported that "severe hearing impairment was associated with 42 percent greater prevalence of low levels of social engagement" (p. 142). Grandparents sometimes have a hard time hearing grandchildren's voices because they are a higher frequency. It is not uncommon for an older adult to believe they are becoming "senile" when they cannot understand their friends and family, or when they become disoriented in an environment due to the complex nature of presbycusis (Hull, 1995, p. 51). Fear of being a burden can keep an older parent from discussing their hearing problems with adult children. These feelings threaten an older adult's valued sense of independence and contribute to the debilitating effects of untreated hearing loss. "Acoustics is the science of sound" (Cowan, 2000, p. 3). As an architectural field, acoustics is a relatively new development. Thus the application of acoustical knowledge in the form of codes or standards is only beginning to have a structured impact on how we design and construct our built environments. Acoustic standards are created by the American National Standards Institute (ANSI) and the American Society for Testing and Materials (ASTM). These voluntary standards are written by specialists with knowledge of acoustics and the programmatic needs for specific spaces. They are to be reviewed and updated every five years after acceptance (Cowan, 1994). There is not a comprehensive set of acoustical standards that serve particularly LTC facilities. Understanding that hearing impairment is among the top three chronic conditions that residents of LTC facilities face should promote thoughtful research of room acoustics and the implications of hearing loss to these environments (Weinstein, 2000). Acoustics are beginning to be addressed in health care facilities, but many of these focus on hospitals and doctor's offices, which present a different environment than a live-in care facility. Still, they present a springboard from which more research and specialized knowledge can start. It is important to understand the programmatic needs of LTC facilities before codes can be established. There are different zones that require varying degrees of sound control and reduction that can be accomplished through construction methods, thoughtful planning, and intelligent material choices throughout the space. LTC facilities include lobbies, dining facilities, gathering spaces, residential rooms, mechanical, and equipment rooms (including medical equipment), among other spaces. Each of these functions must be thought about in respect to how a hearing impaired individual would use the space. Lobbies are generally designed to be exciting, energetic spaces that are inviting, and portray an entertaining "front door" for the building. In contrast, Lorraine Hiatt (1990, p. 201) points out in a Journal of Health Care Interior Design article that a "quiet lobby not only will attract families into the unit, it also reduced much of the agitation that so characterizes most of our nursing homes." Dining areas also present a challenge for older adults with hearing loss. The sounds of clattering dishes, people coming and going, and overlapping conversations provide an onslaught of acoustical baggage. Although hearing aids are useful in amplifying sound, their drawback lies in that they do not filter those sounds. This results in a cacophony of noise amplified directly into the resident's ear. It is not uncommon for them to respond by removing their hearing aid, preferring the silence and inability to interact in conversation to the loud, undistinguishable sounds surrounding them (Davies, et al., 2001). Acoustical codes for restaurants can be reviewed when designing dining facilities for health care. Acoustical considerations specifically for those with hearing loss may include the incorporation of good lighting (to help with lip reading), distancing kitchen equipment that produces environmental noise from the seating area, and designing the seating arrangement in small groups settings, next to absorptive materials, to keep conversations more contained (Dugan, 2003). The growing body of knowledge and standards related to acoustics in educational facilities is bringing to attention the negative effects that youth experience in environments that ignore acoustics (Moseley-Braun, Kennedy, Pell, Simon, & Wellstone, 1997; Seep, Glosemeyer, Hulce, Linn, Aytar, 2000). It now waits for designers to realize the unique impact that acoustics play in the quality of life for those at the other end of the lifespan. When designing for hearing impairment in elderly populations the difference between "sound" and "noise" becomes especially significant. They want to hear whom they are talking to, without that conversation being distorted by background noise. Cowan, in his Handbook of Environmental Acoustics (1994, p. 1) makes the statement "noise, in its simplest definition, is unwanted sound." When designers seek to understand what an older adult considers "sound" versus "noise" they can begin to address acoustics according to the their users' needs. As health care facilities are being designed in anticipation of retiring baby boomers, what should we be building? Current award-winning health care design is not directly considering the acoustic implications on elderly, hearing impaired users (Healthcare Design, 2002; Healthcare Design 2003). It is unfortunate that we continue to build environments without a clear sense of strategic acoustic design, and in which the users' comfort will be compromised. In one of very few articles directly addressing acoustics and hearing loss, William Davies and his partners (2001) point out that most environments are designed with the "assumption of normal hearing." They address several acoustic problems this assumption produces for those with hearing loss. A significant issue is the interference of background noise with speech comprehension. The presence and intensity of reverberation, background (or "white") noise, and background speakers in large rooms all contribute to this problem (Davies, et al, 2001; Tun & Wingfield, 1999). Davies also points out that improper insulation increases the difficulty elderly individuals encounter in their surrounding environments when listening to "reproduced sound," including televisions and radios. Often times they will not listen to their radio at a level that they can hear, because they are afraid that it will bother their neighbors. Instances like this represent a compromised quality of life. Thoughtful acoustic choices in the design process can help lessen environmental limitations such as these. 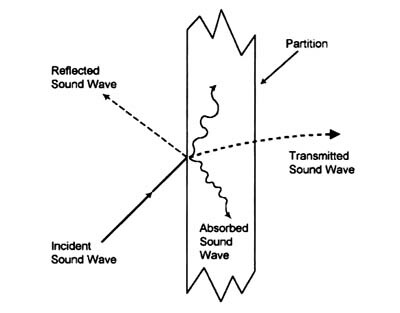 Absorption reduces sound within rooms (figure 5); whereas insulation reduces sound between rooms. These two concepts applied strategically within a LTC facility will help maintain privacy while maximizing the audibility of desired sounds for residents. Figure 5: Possible sound wave reactions to partitions. Cowan, J. (2000). Architectural acoustics design guide (p. 24). New York: McGraw-Hill. Without standards, design can only be evaluated by comparing which one is "better", without assessing how successfully they respond to user wants and needs (Keates & Clarkson, 2003). This is the challenge that designers will face as they begin to make decisions without established standards that present a clear picture of the acoustical needs for LTC environments. Within 20 years it is predicted that the speech comprehension component of hearing loss will be treatable with medication (Weinstein, 2000). If this forecast is correct than acoustical standards will be all the more important, because hearing difficulties will be related more closely to interaction with the external environment and less with internal cognition. This is precisely when the baby-boomers will be hitting their stride in retirement. Designers within the health care field need to push for research and implementation of appropriate acoustical standards so that buildings effectively respond to the physiological and psychosocial needs of the elderly. In this way older adults can maintain their relationships and retain their independence as long as possible; thus promoting a higher quality of life for this growing population. Cowan, J. (2000). Architectural acoustics design guide. New York: McGraw-Hill. Cowan, J. P. (1994). Handbook of environmental acoustics. New York: Van Nostrand Reinhold. Davies, W. J., Cox, T. J., Kearon, A. T., Longhurst, B. J., & Webb, C. L. (2001). Towards room acoustics for an elderly population. Proc. Institute of Acoustics, 22(2), 459-466. Dugan, M. B. (2003). Living with hearing loss. Washington, D.C.: Gallaudet University Press. Healthcare Design. (2002, September). 33-134. Healthcare Design. (2003, September). 3(3), 46-203. Hiatt, L. (1990). Long-term-care facilities. Journal of Heath Care Interior Design, 2, 195-205. Hull, R. H. (1995). Hearing in aging. San Diego, CA: Singular Publishing Group. Keates, S., & Clarkson. (2003). Countering design exclusion: An introduction to inclusive design. London: Springer. Levin, D. (2002, September). Design based on the evidence. Healthcare Design, 6-7. Peck, R. (2003, March). Touring the hospital future. Healthcare Design, 3(1), 71-74. Resnick, H., Brant, E., & Verbugge, L. (1997). Windows to their world: The effect of sensory impairments on social engagement and activity time in nursing home residents. Journal of Gerontology: Social Sciences, 52B(3), 135-144. Tun, P. & Wingfield, A. (1999). One voice too many: Adult age differences in language processing with different types of distracting sounds. Journal of Gerontology: Psychological Sciences, 54B(5), 317-327.